I woke up around 7 and felt like it was 5 in the morning but in Pennsylvania 9 I guess. Made a smoothie Jim had eggs and toast. Monday I made a nail appointment for 11 today. We were watching The Today Show. I told Jim should we go now, so we went to my appointment, Jim dropped me off. And I went in and he took my polish off, we talked about the gel polish, he seamed confused on what to do. The towel looked dirty that they had down and I just said thanks but no thanks and then I left. Called Jim and he came back for me, we went into Walmart to drop off his prescription. We went and had pizza at a place that was recommended. We ordered a thin crust. We were really hungry by then and somehow our order got delayed we waited forever. When we finally got it it was really good. 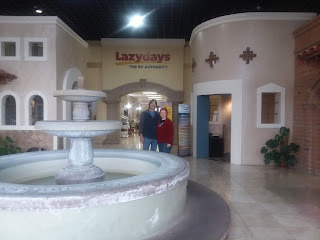 We decided to go to Lazydays and Camping World in Tucson today. We went to Camping World first we wanted to get a water bladder so we can transport water at the rally. And we wanted to replace our electric water hose that leaked, we had an extended warranty on it so we switched that out. Then we went to Lazydays Tucson. We went in they were very nice we went to the service entrance. We wanted to make an appointment for a few little minor things that needed taken care of in the rig. It was about six different things. We made an appointment, they were booked up through good part of February. We made it for the end of February so we'll be back in a month. And the lady had her nails done so I asked her where she had them done she told me where she goes. So I took my unpainted Nails over there. They were okay hard to understand she wanted me to do the dip nails but I have gel. She kept trying to talk me into it but I just said do the gel Jim was waiting for me, I took my nail polish along, but I said I'll just do it myself so we can get out of there. First day we drove after dark, little bit of rain on the way home, was about 40 miles away total, we got home, I heated up turkey burgers we pre-grilled yesterday before the tuna steaks. Jim showered while I got dinner ready. We watched some TV. I took a shower, finally put polish on my nails, Jim washd the dishes then we called it a night.